For around $25, customers can play games on the HTC Vive, Oculus Rift and Playstation VR. The tech industry is banking on VR, but most folks have never even tested a headset like the Oculus Rift, let alone plunked down $500-plus to buy one. In France, at least, it's about to become easier to try them out, thanks to a Paris movie theater chain called MK2. It's launched a virtual reality experience featuring the latest games and videos on the Rift, Sony's PlayStation VR and the HTC Vive. 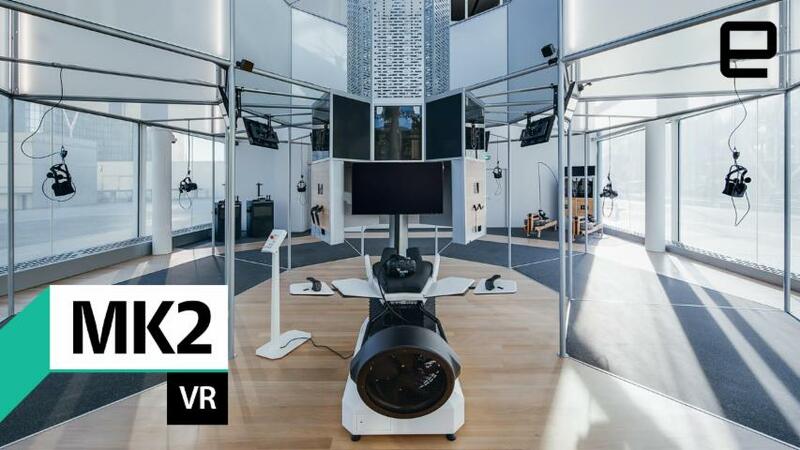 At $25 for 40 minutes, you can play games like The Climb and Star Wars Battlefront: Mission X-Wing VR, watch VR films, or fly over Manhattan in the Birdly motion sim. 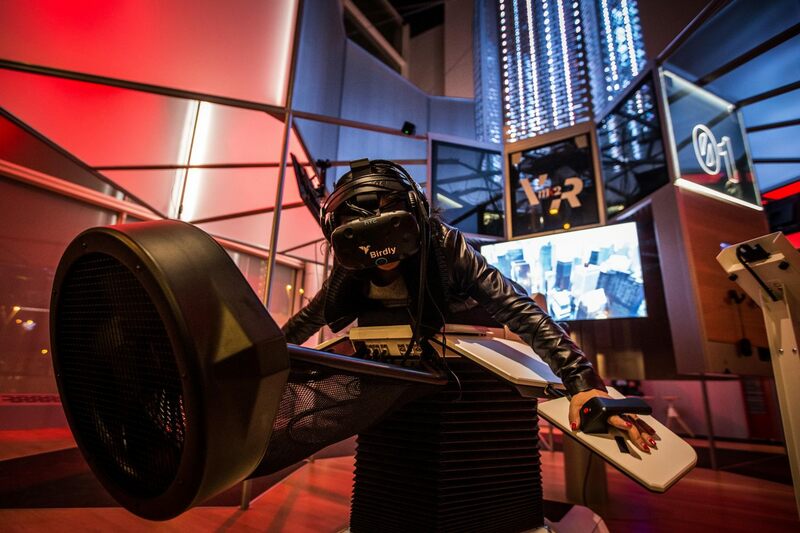 "MK2 VR is the first facility in France dedicated to the best VR experiences in films, documentaries, video games and even flying motion sims," said GM Elisha Karmitz. The company is piloting the idea at a 3,000-square-foot space located at MK2's flagship cinema in the southeast of Paris and granted me a visit before today's opening. The company is trying to balance the cutting-edge technology with accessibility and chic decor. The wood, glass and metal VR space housing the 12 VR "pods" is cozy, but appears bigger thanks to large windows and a high ceiling. While waiting your turn, you can buy drinks in a tent-covered tiki-style bar that was still under construction when I visited. 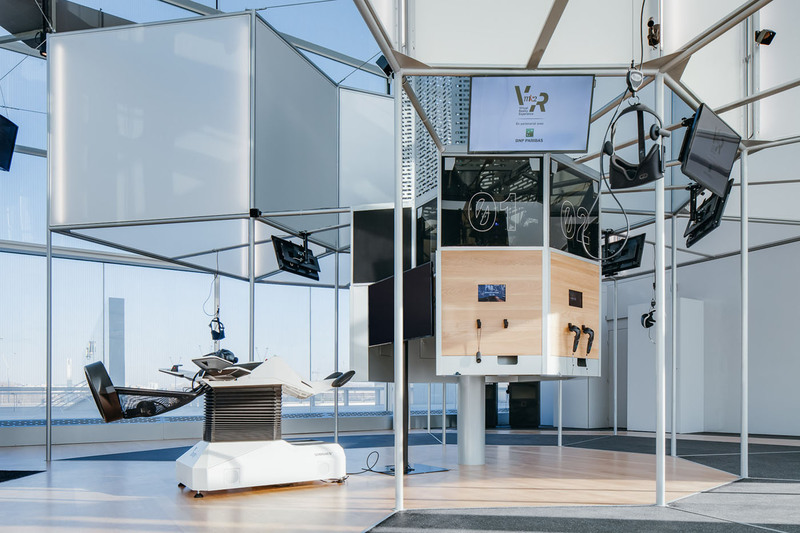 The pods are arranged around a circular station with various games and headsets hung by cables that make them easy to don and safely limit your motion. Some titles require you to stand and others are better seated, and there's also the Birdly flying motion sim and pair of Holodia rowing trainers set up for racing. MK2 will have plenty of staff on hand to help customers at the stations. "It's really important that we bring the VR experience to people who don't know VR," Karmitz said. "So there will be approximately one employee for every three consumers, who will help them put on the headset and launch the experience." There are also tech staff on hand to handle the headsets and MSI computers, equipped with NVIDIA GeForce 1080 cards and Intel Core i7-6700K CPUs. For the Oculus Rift, you can try Homebound Joyride, an exclusive, faster-moving version of the standalone VR title, as well as The Climb, a rock-climbing game that uses the just-released Oculus Touch controllers. Newcomers can watch Introduction to VR, a 360-degree, 3D video for Oculus Rift produced by Montreal-based VR producers Félix & Paul Studios. HTC Vive fans can check out the Birdly and Holofit motion sims, Space Pirate Trainer shooting arcade, and The Walk, a title that puts you on a vertigo-inducing gangplank nearly 1,000 feet over the streets of Manhattan. On the Playstation VR, meanwhile, you can experience a simulated dive and shark attack in Ocean Descent VR, try Star Wars Battlefront Rogue One: Mission X-Wing VR, or play Ubisoft's Eagle Flight -- another flying game, this one set appropriately in Paris. From December 9th to 31st, MK2 VR will offer an exclusive Assassin's Creed VR experience for PS VR from the long-awaited Michael Fassbender film, set to arrive on December 21st. While I was there, I checked out Birdly, an HTC Vive motion sim that that you can lie down on and control by tilting two paddles back and forth. It lifts, pitches and tilts to match the headset motion which creates some strong sensations, especially the first time you dive directly toward the ground. I also tried out The Climb on Oculus Rift, a rock-climbing game that takes advantage of the Touch controllers and will also test your fear of heights. Finally, I tested Star Wars Battlefront Rogue One: X-Wing VR Mission, a brand-new Playstation VR title. With the ability to look around the highly detailed cockpit and the galaxy, it's one of the best flight combat sims I've ever tried. The experience runs €12 for 20 minutes, or €20 (around $25) for 40 minutes, and you're free to check out any games or sims you want. While that might seem like a lot compared to a movie, my experience shows that it's a cheap way to try out all three headsets, back to back, if you're still trying to figure out which to buy. Meanwhile, if you already own a headset it's a great way to test games before spending up to $700 to buy one. MK2 has managed to score some exclusive deals with publishers, getting titles as soon as they're released, as well as special versions that condense the action. Karmitz also thinks the experience will make for a fun night out for a group of friends, especially with the option to loosen up with a few drinks before jumping into the games. Additionally, the company is pitching it as a corporate-bonding experience and will rent out the space for private groups. MK2 VR is piloting the experience at one Paris theater but hopes to expand to others if it works out. Their execution looks solid, but since it's one of the first such VR spaces out there, it's hard to say whether it'll succeed financially. The concept makes a lot of sense, though. Considering how expensive console and PC-based VRs are, most people are going to want to try before they buy. And, as is the way in Paris, why not do it while partying with your friends?